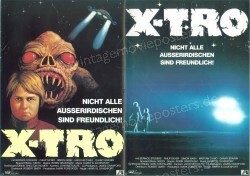 German Lobby Card approx. 9,5 x 11,9 inch - Condition: excellent k.a. German Distribution Advertising Flyer approx. Din A4 - Condition: excellent k.a. German Presskit ca. 8,4" x 12" - Condition: very good k.a.